When Tom zapped Frankie the goldfish back to life with a battery, he certainly didn't expect him to become a BIG FAT ZOMBIE GOLDFISH with incredible hypnotic powers. But it turns out that a zombie goldfish is a great pet to have on your side when your big brother is an evil scientist whose plans need to be thwarted. There's something fishy going on in the woods, as Tom and his best friend Pradeep take Frankie on a camping adventure. Could the Beast of Burdock Woods be real? Then, something weird is going on with Mark. He's actually being . . . nice! Meanwhile, paranormal pets (including a teleporting tortoise, a mostly invisible poodle, a levitating budgie, and a vampire kitten) are missing all over town. Can Tom and Pradeep find out what's going on before Frankie disappears? 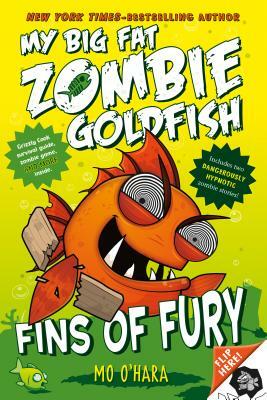 Fins of Fury: My Big Fat Zombie Goldfish by Mo O'Hara, illustrated by Marek Jagucki, is a funny, zany adventure--and the paperback contains bonus material like the Grizzly cook survival guide, zombie game, and more! Mo O’Hara is the author of the My Big Fat Zombie Goldfish series. She grew up in Pennsylvania and now lives in London, where she works as a writer, actor, and storyteller, visiting theaters and schools all across the UK and Ireland. Mo and her brother once brought their own pet goldfish back from the brink of death (true fact). Marek Jagucki, the illustrator of the My Big Fat Zombie Goldfish series, is a graduate of Falmouth School of Art and Design. He is a full-time illustrator and graphic designer based in Yorkshire, UK.